I may not have monsters lurking under my bed, but they’re calling to me from my laptop and my smartphone. Damn you, social media. Using social media for work makes it easy to justify starting your day browsing Facebook and Twitter, but minutes can easily turn into hours until you realize you’re clicking on Buzzfeed articles about annoying airline passengers and slideshows of celebrities out with their kids. As everyone is making New Year’s resolutions to become better versions of themselves, here are my tips on how to stop the social media procrastination monster and get stuff done. We love to brag about being a multi-tasker—c’mon, I too, have used this phrase in cover letters as a selling point. But let’s just stop it. Multi-tasking does not work. While I can handle multiple projects, I don’t mean working on all of them at exactly the same time. When you’re working on something, you actually need to focus on that work. Otherwise, your brain is not as efficient and you’re actually less productive. Turn off your audible alerts and place your phone out of eyesight. Otherwise, you’re interrupting your thinking process to respond to that email ding or Twitter interaction chime. And it can take you 23 minutes or so for your brain to switch back to your original task. Shut down or minimize your web browser, so you can’t glance at it. If you need to do do online research, close all your social media tabs and disable pop-up notifications. If it helps to give yourself a time limit before you can check your Facebook feed or comment on a LinkedIn post, do that. In fact, researchers have discovered that our brain only works well in 90- to 120-minute chunks. Then we need a break. I know, it’s easier to say “minimize distractions” and “stick to your plan” more than it is to actually do it. But, you really have to figure out a routine that works for you and stay with it. I work well in the mornings, so whether I get up early to run or I sleep in, I aim to be in my home office by 9 am every day to start working. I spend no more than an hour on email and social media—sometimes less. My new goal is to spend one of those 9–10 am hours writing a blog post at least once a week (see how I’m accomplishing that today!). Not everyone works well from 9 am to 5 pm, and if you’re lucky enough to be in charge of your own schedule, working from 6 am to 2 pm or 11 am to 7 pm may work better for you. I sometimes like to break up my day with a hiatus from 3 to 6 pm or so, eat dinner and then go back to work for a few hours. Each morning, don’t wonder what you need to do. Have your plan ready. End each work day by creating your next day’s “to do” list. And don’t make it so optimistic that it’s not realistic. An unwieldy to do list becomes overwhelming and makes it easier to just quit. Instead, keep an ongoing list on a whiteboard or thoughts in an idea journal for more long-term items. Each night, write your “must do” to do list for the next day. If it appears you’ll have extra time, transfer ideas and plans from the whiteboard or journal onto the to do list. This sounds simple, but we don’t do it, so start forming this habit. As an extremely organized person, with mild procrastination creeping in, I have become quite fascinated recently with ways to bring even more order to my work life. 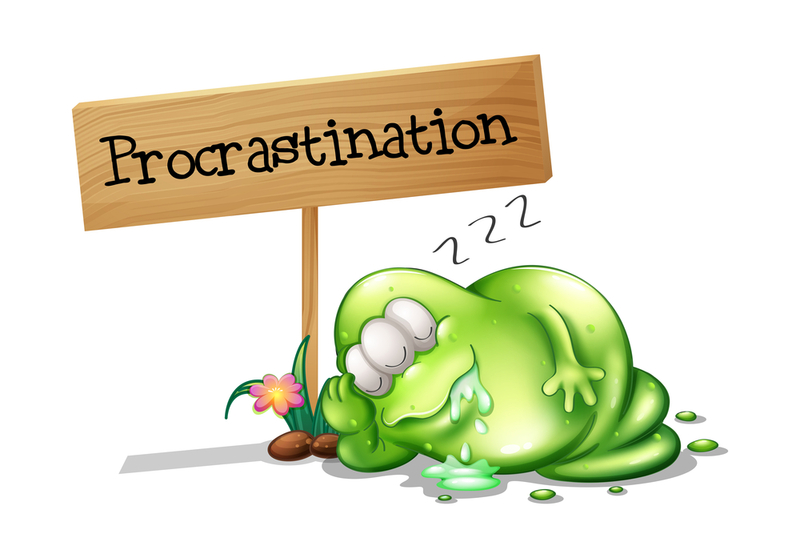 What procrastination monsters do you battle and how do you win the fight? Thanks for the great advice! I am extremely overloaded these days and need to follow it! I love that “Multitasking doesn’t work” concept. I have an issue with working on so many things simultaneously, they all end up as a mess for me always. Need to focus on one thing at a time. Yes! There are some superficial things you can do at the same time, like cook and listen to music or fold laundry and listen to a podcast or watch TV. But multitasking with work just equals distraction and prevents you from truly focusing. Better to go through the list of things one at a time. Good luck!